We are now back from a great 4 weeks in Zambia. It was eventful. This blog post contains the headlines – both the Top Ten Good News stories and Bottom Six Bad! Jane and I arrived at Lusaka airport within 30 minutes of each other from two different directions. Jane had travelled direct from the UK, via Dubai, where she had been reporting to our Trustees, showing The Cola Road film at SOAS, and attending a workshop on UK Aid Direct funding. I had come from Addis Ababa, where I’d attended a workshop and presented our work to members of the ANDi Network. As usual, we got a very warm welcome on our arrival from all quarters. This started at the immigration counter. Since the ColaLife trial and initial scale-up work ended in June last year (Jun-14), we are no longer employed in Zamia by COMESA; as part of our strategy to ‘hand over’ to local organisations, we are now visiting Zambia 3-4 times a year. We’d mistakenly thought that that one could spend 60 days a year on a business visa in Zambia. That’s not the case. It’s 30 days and we’d already used up 22 of those on our last trip! Anyway, the Immigration Officer was sympathetic, gave us another 30 days and wished us well. The need to regularise our status during the trip went to the top of our to do list. Within moments of leaving the arrivals hall, we bumped into my favourite taxi driver who happened to be right there. He drove us into Lusaka and filled us in on the local news. This was mainly around the election of Zambia’s new president. Zambia very rarely sees trouble on the streets, but we’d timed our trip to be after results were declared, just in case. However, in true Zambian style, votes were still being counted – and in some remote parts of the country were still being cast! The first partner I met was Pharmanova, our manufacturing partner. That resulted in a long to do list on both sides. 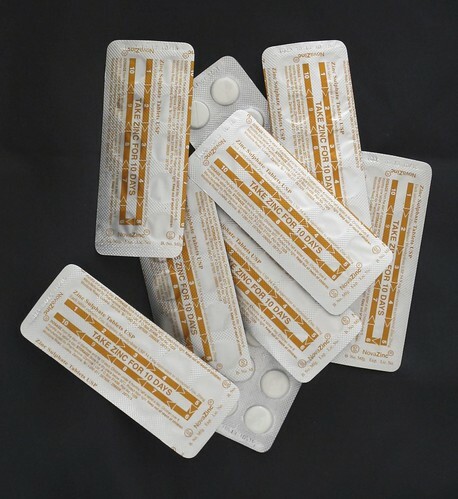 As well as manufacturing Kit Yamoyo and selling into the open market since the end of the trial, Pharmanova have taken the initiative to produce their own Zinc tablets, in country. The trial helped them to see real potential for this new line, in a country where imports of Zinc are erratic, expensive and sorely needed! Although temporary approval for the production of the the new Pharmanova zinc – NovaZinc – which I’d requested at the end of our last visit – had not come through, Pharmanova were still keen to move it forward. At the first opportunity, I visited the Ministry of Health. I know how the ‘merry-go-round’ of the administration works now, and, sure enough, I found the approval sitting there in the filing system. Finally, Pharmanova are all clear to produce their own zinc pending full approval. This is still subject to them submitting samples from each batch for analysis by the regulator ZAMRA and production won’t start immediately as the raw materials need to be imported – but at least it’s a very significant step in the right direction. The next significant meeting was an all-day planning session with Keepers Zambia Foundation (KZF), where we agreed a formal ‘counter-parting’ arrangement – a key part of our hand-over strategy. KZF have been our partner since the early planning days of the trial. This partnership works really well, as we each have our strengths: as a local NGO of nearly 20 years’ standing, KZF have strong links at grass roots level in many areas of Zambia, as well as a deep cultural, social and economic understanding. ColaLife has international and national leverage, as well as expertise: in project management, communications and Social Media, and public health. We can also access different funds and have each been bidding where we can, to cover various parts of the country, as well as international dissemination work. The big KZF news was that they had just signed a contract for the KYTS-ACE project under Zambia’s Scaling Up Nutrition (SUN programme). KYTS-ACE stands for Kit Yamoyo Transition to Scale – Adapting to Challenging Environments – ie we want to learn more about serving the 20% of Zambia’s population who live in 14 ‘SUN’ districts, where market-based approaches may face challenges. I described KYTS-ACE in more detail here. We helped KZF plan, write and submit the bid for this funding just before we left Zambia in Jun-14. 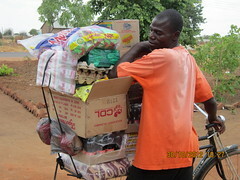 A key element of this work is that it will provide funding for 452,000 kits to be distributed through the public sector to 11 of the most remote districts in Zambia, alongside developing private sector routes to market in 4 districts – through small shop-keepers, like in the trial, as well as supermarkets. We’re still avidly seeking funding for a market-led approach in more viable, high-population areas. Jane is leading on this. We were up till nearly midnight on 30-Jan, putting the final touches to a project called KYTS-Lusaka. This will take forward the pilot we ran with KZF in Lusaka’s ‘compounds’ (townships) from Jun to Dec-14 last year, and will cover 20% of Zambia’a people. We should hear from UK Aid Direct in May-15 with a start date in Aug-15. If we are successful, that will only leave still unfunded our plans for the heavily-populated Copperbelt (with the by-now predictable working title of ‘KYTS-Copperbelt’). Another 20% of the population reside there – so, with 60% of the population covered through 3 major projects by the end of 2018, we are confident that Kit Yamoyo will be well-established and no further donor support will be needed – at least in the private sector. I always like to get out into the bush, and in the second week of our visit – by the skin of my teeth following a last-minute Landrover fuel leak – I travelled to Katete along with my long-standing colleague Albert Saka from KZF and two visitors: Matt and Sarah. Matt works for GSK and manages the GSK side of the GSK and Save The Children Healthcare Innovation Award. As reported earlier we’d known this exciting news since Christmas, but the award was about to be publicly announced. Sarah works for EY and came across ColaLife in her work there and was inspired. 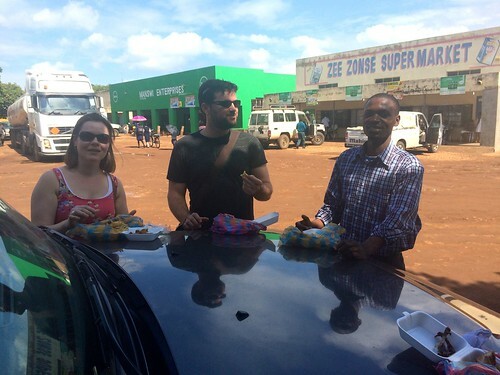 So she requested a few additional CSR days from EY and booked a flight out to Lusaka to see things for herself. We also managed to take in a visit to shops and Health Centres in Lusaka compounds. The highlight of this visit was the Roundtable on Innovation in Child Health with Dr Kasonde, the Hon Minister of Health as guest of honour. 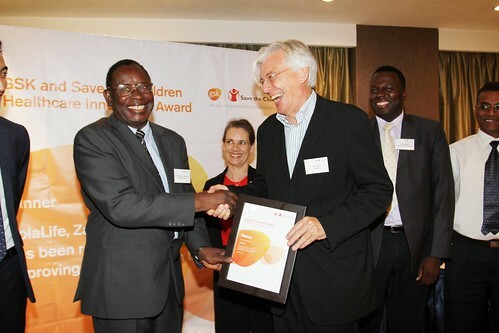 This culminated with the presentation of the GSK and Save The Children Award. This award is fantastic for us – not only for the additional funding it brings, but for the opportunities to network and influence. Already by the end of our stay, Jane had run a workshop with Save The Children Zambia to see how they could integrate learning on distribution and product design into their work. There was a lot of local news coverage – we were featured in the press several times and it was great to hear ‘Kit Yamoyo’ mentioned on the radio. As usual we managed to pack in a range of meetings with key partners, collaborators and friends: as well as those mentioned, these included UNICEF, Medical Stores Ltd (the government distributor), USAID DELIVER and JSI, the GSK/Barclays health services development project, CIDRZ, Dimagi, IDinsight, Society for Family Health, iDE, Every Child Fed, local social enterprise Silva Catering and the ever-inspiring Kapumpe Musokanya from Toilet Yanga. Not to mention: 3 Q&A Skypes with Indian audiences at showings of The Cola Road film, tea with a Minister’s daughter who was also at the ANDi meeting (to pick each other’s brains on health access); a run with our crazy mates at Lusaka Hash House Harriers, 3 very muddy mountain bike rides and Burns Night Lusaka-Style, complete with bagpipes and haggis. 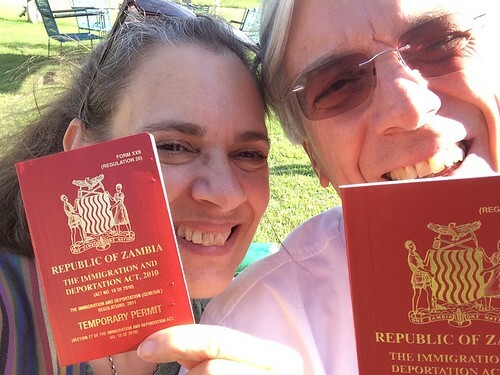 After a couple of visits to the Zambian Immigration Department we were granted temporary permits at literally the eleventh hour! We got locked in at Immigration for an hour after their doors closed on the last working day of our trip, so they could rush the permits through. These will enable us to come and go as we need to over the next 12 months. 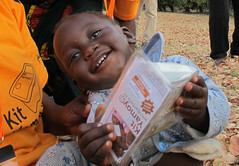 Due to funding constraints, we left Zambia last year much earlier than we’d intended. We’ve always known it will take time to establish Kit Yamoyo in the market and embed the learning amongst partners and stakeholders. For a new, low-cost product like Kit Yamoyo, the private sector can be persuaded to back it, to take a risk, if potential profits stack up. But early-stage risk has to be shared – ie funded from somewhere. This includes the costs of product launch, education of shop-keepers, awareness raising in communities, and an over-arching broadcast campaign – which we’ve so far not been able to fund. The public sector will also back it, if the health benefits stack up (which they do). But with so many demands on budgets and myriad priorities, it too wants risk shared. A champion has to drive things forward. That’s our job, and inevitably, in our absence, some things had slowed down or even stalled. Just after we arrived, on 26-Jan-15 we heard (over 6 months late!) that our funding bid to USAID to scale-up Kit Yamoyo in Zambia and 2-3 other countries, had been turned down – in spite of months of encouraging feedback. With little market development funding available over the last 6 months, sales into the private sector have been slow. To counter this, Pharmanova have now agreed to fund and support a dedicated sales person, on the back of the new projects launching (KYTS-ACE and hopefully KYTS-Lusaka). Confirmation of the Scaling Up Nutrition (SUN) funding was also delayed (see item 1.5 above). We’d been hoping that would begin in Sep-14. This means a 24 month project will have to be squeezed into 17 months which will be a bit of a challenge. Local production of 25g soap, which we hoped to catalyse through Zambia’s only soap manufacturer, had been delayed – for a raft of reasons. We’re still pushing that one but in the meantime Pharmanova will continue to import the soap from India. Finally, and very sadly our greatly-admired friend, Mark Bennet, founder of i-school, fell ill during our visit. The world lost an inspirational educator, Social Entrepreneur and generous sharer of learning, on 10-Feb-15. “Have you come back for a bit of Fire-Fighting?” asked an aquaintence, soon after our arrival. “No,” quipped Jane, “we’ve come for Fire-Lighting.” And that just about sums it up. On balance we were really pleased with the progress made since our last support visit in Nov-14. We were able to push things along a bit and help unblock a couple of processes that had stalled or were progressing very slowly. We will continue to visit Zambia quarterly – as part of our new counter-parting agreement – until Kit Yamoyo is established as a product across the whole of Zambia, and push forward the access agenda internationally – until every mother can easily get – and correctly use – the ORS and Zinc she needs to save her child’s life. Hi Simon, an interesting read and great to hear up to date news from Zambia. You seem to have your hands full on this project but it looks as if it could be successful and a big help to the country. All the best mate and keep up the good work. regards to all your family too they must all be bigger than I am by now.